If you were granted face time with a local politician, what would you want to know? For Prairie’s fifth grade students, the hot topic boiled down to one question: how do you work together across party lines? 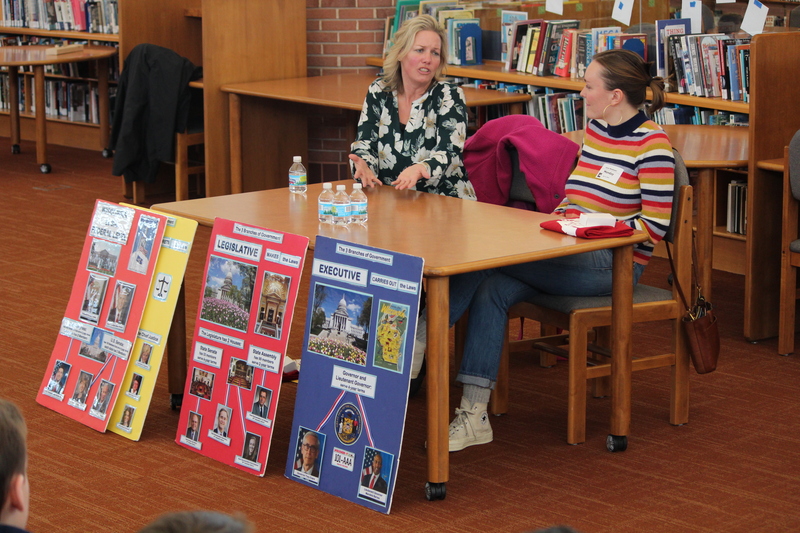 This winter, 5th Grade social studies students hosted a pair of state legislators to discuss the purpose of government. State Representatives Samantha Kerkman (Kenosha County) and Greta Neubauer (Racine) came armed with information about the executive, legislative, and judicial branches of government in Wisconsin and nationwide. But most of their conversation shied away from the talking points you’d ordinarily hear during a political visit. Kerkman is a Republican, Neubauer a Democrat. And the fact that they could sit next to each other, exchanging ideas and conversing politely, interested many of the students. It made them curious enough to ask: how do you work together with someone when you don’t see eye-to-eye? Much of the ensuing conversation between the students and their guests focused on how important it is to work together and respect each other, even when your views or opinions don’t align. The lawmakers discussed the differences and similarities between their two parties: what does a Republican viewpoint typically encompass? What about summing up a Democratic point of view? How do you balance getting your point across while still being respectful of your peers in the Statehouse? Neubauer ’10 said she sees the students’ curiosity as a good thing, especially at their impressionable stage in life. "These are people we want to participate in their government — we want them to believe that there's good reason to do that, and know that there are ways they can actually express their opinions now, as fifth and sixth graders." Both Neubauer and Kerkman told the students that talking to people their age is one of the best aspects of a job in government — helping young people understand the ways decisions on a local, state, or national level are impacting them and their families. Kathy Boero, Head of the Middle School, expressed excitement that the students had a chance to infuse some character education learning into their social studies class. “The conversation, questions, and thoughtful, respectful discussion that took place was inspiring, and at times made it difficult to believe that the students were not from an Upper School Government class!” Boero said.